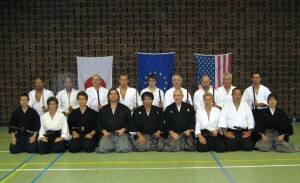 October 2012 we have our annual seminar with Hanshi Masayuki Shimabukuro and most likely Kyoshi Carl E. Long. The dates are from October 04 until October 08, 2012. During jodo classes on Thursday, Saturday and Monday there will be simultaneous Iai-classes for those who don’t practice Jodo! We need pre-registration and payment before September 01, 2012, so we can schedule our location on the hand of the pre-inscriptions. Once location is set only limited places to participate will be available afterwards for last minute participants.Pre-registration for dinner on Friday and Saturday evening is required. Testing:Pre-registration and pre-payment is required for testing!Testing for MJER Iaijutsu, Batto-Ho, Jodo and / or Shito Ryu Karate. KNBK/JKI membership required for testing.